I’m on a plane heading to San Francisco for my cousin’s wedding. Actually, while I will be going to the wedding, I’m really going for my parents, who are using this happy pretext to revisit the place where they began their own life together as a married couple. 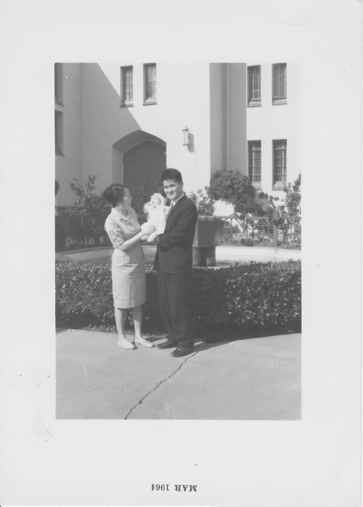 In February 1963, my father was a student in San Francisco. Against all odds, he had managed to make his way to the U.S. to pursue the education that had cruelly eluded him during a childhood filled with adversity and suffering. School was a luxury, a beautiful dream that was constantly interrupted, snatched away, and cut short by real nightmares: air raids, forced labor by the Japanese occupiers, disease…The sudden and premature death of his father was disastrous for his family, already reeling under the privations brought about by the occupation. My father witnessed beloved siblings die from malnutrition – the very thought brings me to my knees. The family was able to scrape together enough money to pay for only one son’s school fees. The others had to help on the farm so that the family could survive. When my father’s older brother saw how desperate he was to get an education, and though he would sorely miss his help on the farm, he gave him his blessing to leave home at the age of 13 in pursuit of his dream. My father would have to find a way to support himself through school. He still remembers his brother’s sacrifice with deep gratitude. He walked for days to get to Seoul, where he found a job sweeping glass in a watch factory. He worked during the day, went to night school, and at the end of every long day, he would sweep clean a place on the factory floor where he would sleep. Eventually, he enrolled in a new college that had the lowest tuition he could find. The school’s president was the scion of a family of Catholic martyrs: three generations of his family were wiped out on one day. His own father had physically survived the massacre, but was a ruined, broken man. The president had gone on to become the leader of a Christian underground resistance movement. He was repeatedly arrested and tortured by the Japanese for his activities and was always on the run. Fearing for her own safety, his wife would dress as a beggar and hide in the busy marketplace all day, returning home to their children only late at night. Eventually, he led a large group of hundreds of refugees to Manchuria, an arduous journey on foot during which his youngest child, an infant, died. When he was finally able to return to Korea, he founded the college. My father became the president’s star student. He had a fierce hunger and passion for knowledge. He gorged himself on philosophy, history, languages. Emboldened by a degree finally under his belt, and encouraged by American G.I.s he met while doing his compulsory military service, he took and passed a test, which would allow him to continue his studies in the U.S.
Before he was about to graduate, my father went to the president’s office to tell him that he was getting married. 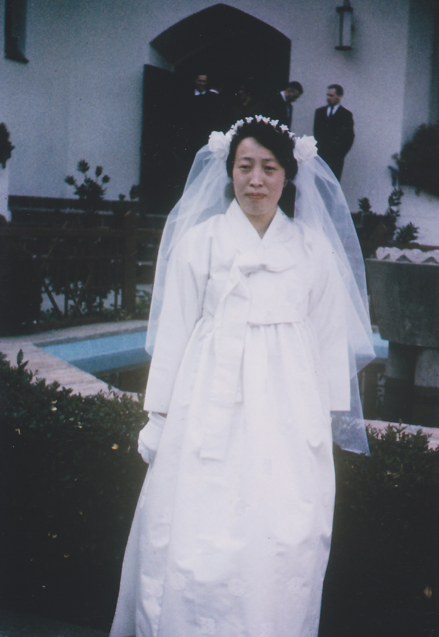 The president congratulated him heartily, and it was only then that my dad revealed that he was going to marry his own daughter, my mother. The college was (and is) an institution where skirt hemlines are strictly monitored and relationships between the sexes are discouraged. How my dad worked up the nerve to court and get engaged to the president’s daughter behind his back is unfathomable to me. His placid, gentle demeanor belies steely, ballsy determination that has carried him throughout his life. It was a difficult first year for my mother. She cried every day because she was homesick and so far away from home. The birth of my oldest sister, and my second sister soon after, brought comfort and joy. 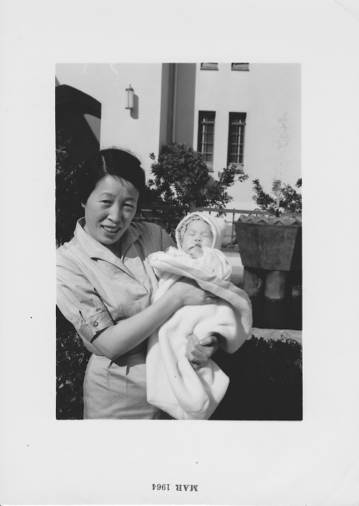 As their family grew and they settled into their new country, my parents began to build a happy life together. Painful memories of the past receded as they made new memories: outings to the zoo with their daughters, the taste of sourdough bread, eating watermelon in their little apartment under the belfry of the Hamilton Square Baptist Church. My mom and dad want to go visit the church that was their first home again. In fact, they’re dragging us all to the service there this Sunday. Because that’s what you do when you fly across a vast continent to spend a weekend in one of the coolest cities in the world. That’s right. You go to church…It’s going to be awesome! Congratulations to my cousin and his soon-to-be wife. I hope you have a long, happy, and beautiful life together. 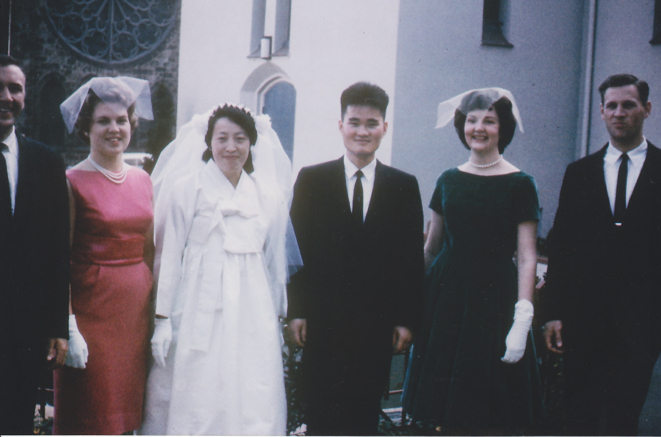 Congratulations and happy homecoming to my mom and dad, whose 50th wedding anniversary we’ll celebrate next year. I am so happy to be taking this journey with you. owonderful • This entry was posted in Family, Travel and tagged family, San Francisco. Bookmark the permalink.